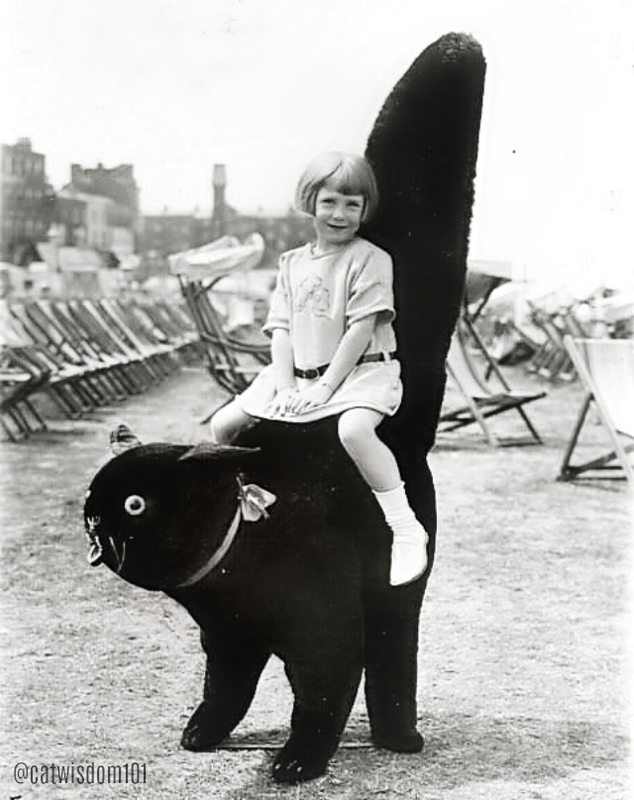 Since 2011, we’ve posted many vintage images of adults and children with cats. Some are as cute as any found today but there is very little racial diversity. 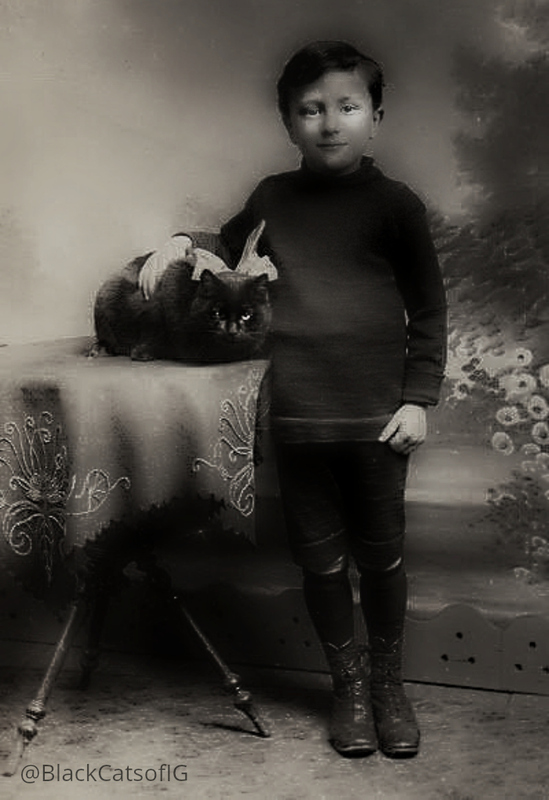 Most depict girls and women but it may come as a surprise how many young boys loved their black cats. There is no question the past decade has seen an upswing in cat lovers of every gender, race, and religion. The antique sepia photos of 100 years ago were usually of upper-crust customers. It’s our hope that this new diverse selection feels more inclusive on every level. The only thing each child shares is their preference for a house-panther for a pet. The images have been restored and edited. It’s for sale at a lower price at Barnes & Noble. No matter where you purchase or if you have a review copy, you can leave a coveted Amazon review. 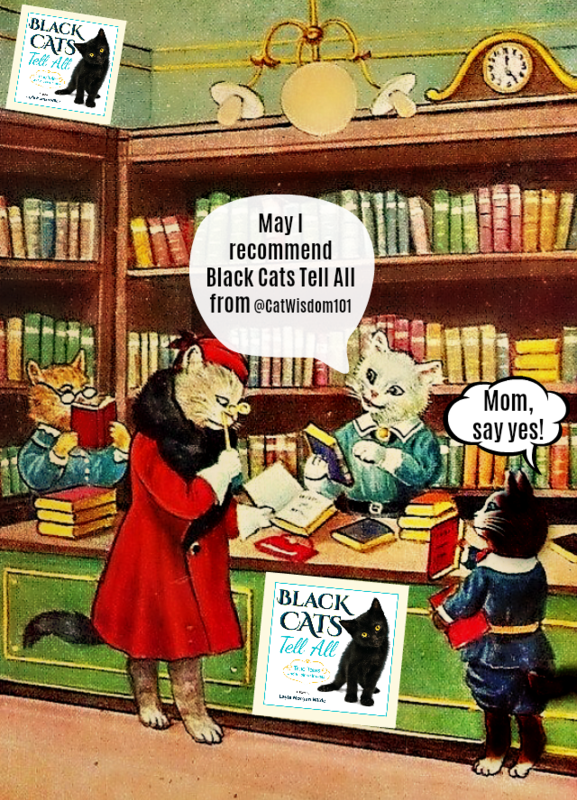 Thanks for supporting our book and cause especially during #BlackCatAwarenessMonth. I couldn’t resist playing with the vintage cat postcard. This dreamy Victorian studio shot is typical of the era. Unlike the perfectly posed and poised girl above, this gal appears more unruly with a cat who is not into the collar and bowtie. 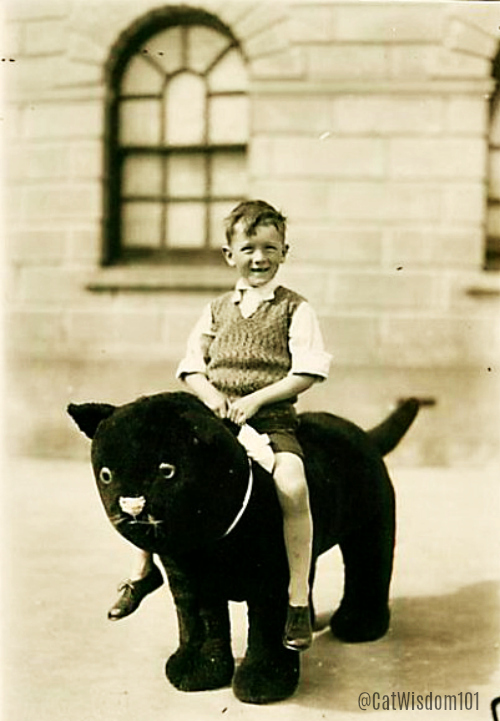 A boy and his mini-panther. Note the large bow. Bowties and neckwear for cats are all the rage on Instagram. 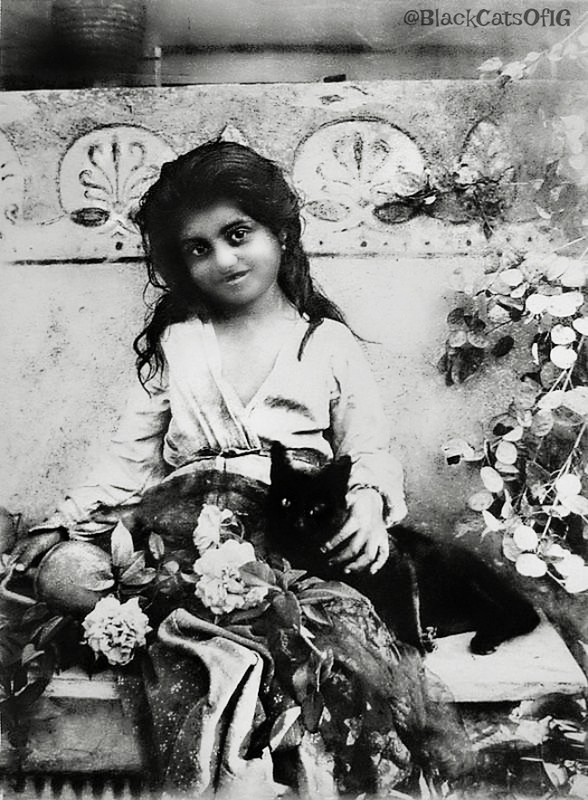 Every so often I’ll find photos of street kids with cats but this is the first time I found a Roma girl. Black cats are revered in Japan and considered lucky. A well-fed house panther is hugged by his human. Photo credit: Kansuke Yamamoto. A very early adventure cat and future TV cat wrangler? Okay, this isn’t a real cat but too cute to resist. Why isn’t anyone making these anymore? I’d love one. Wouldn’t you? Who needs a pony when you can have a giant cat? This is not nearly as impressive as the tail-up version. 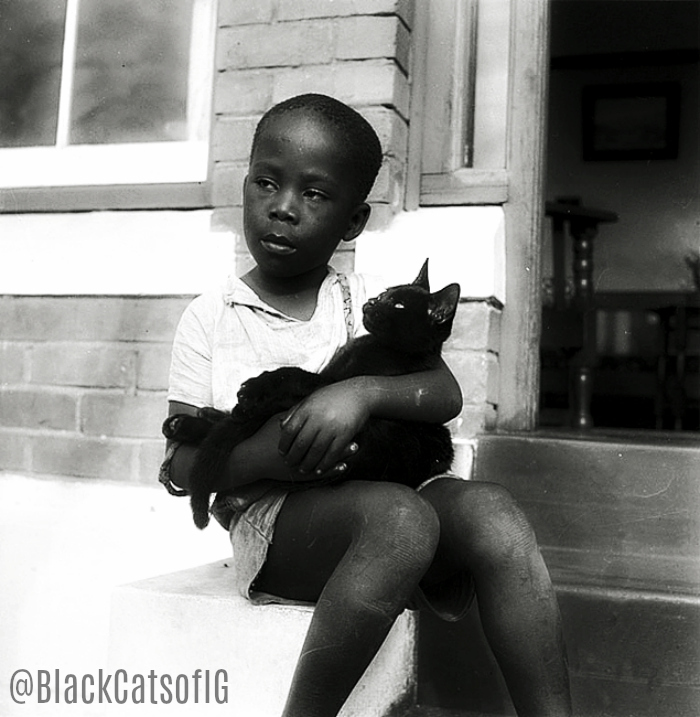 Images of African American children or adults with cats are rare. I love how he’s cradling his black cat like a baby. 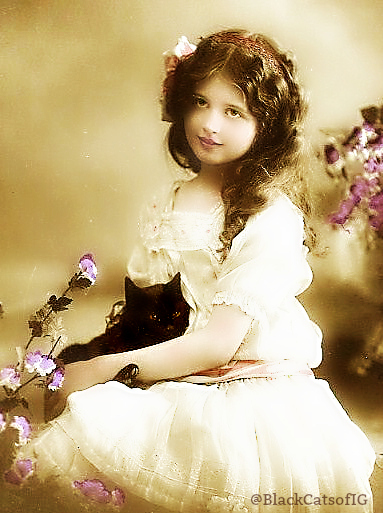 What’s remarkable about this Victorian girl and her cat is the setting. 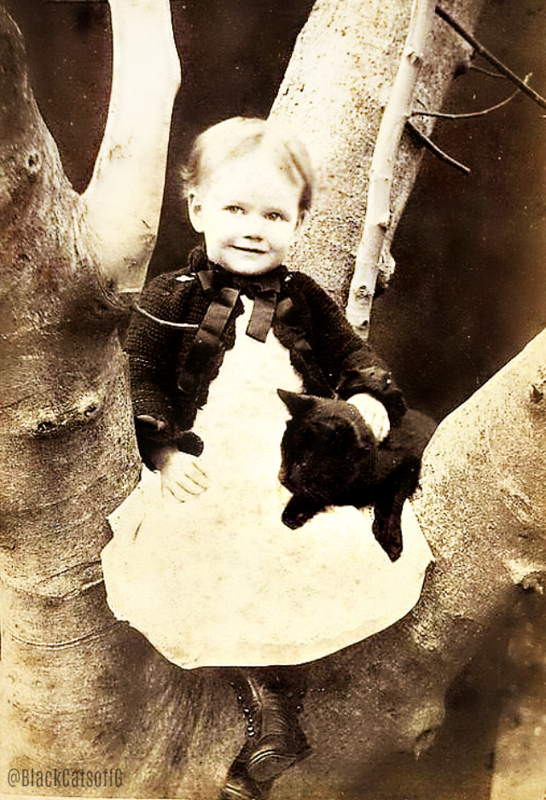 It’s rare to find a posed cat and child image outdoors, let alone up a tree. Such precious pictures; all of them! I love all the photographs, Layla. Thanks for sharing them. 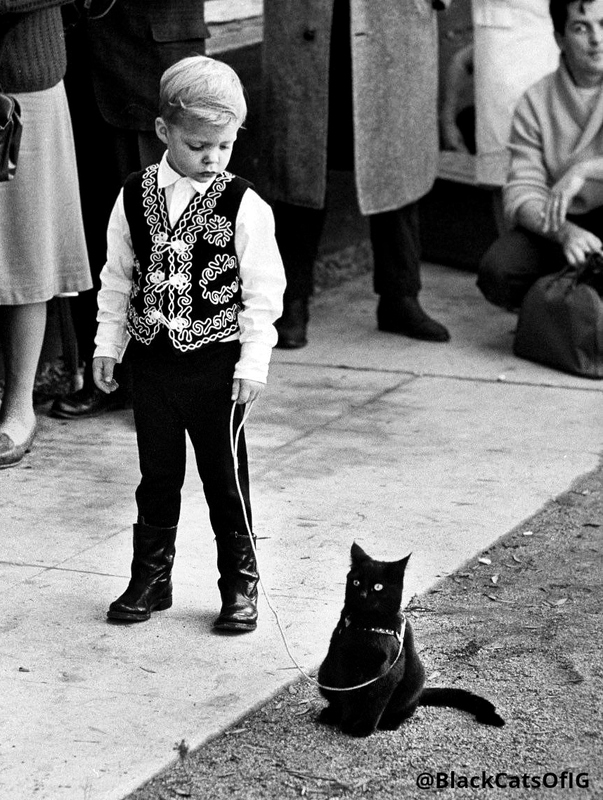 The body language and expression on the cat walked on a leash by the little boy is just wonderful! They all look SO amazing. I can’t pick one! If a picture paints a thousand words……. We love photos that were raw and real not digitally created……We love to look at old photos and wonder about those in them, what were they like, where did they live etc. guyz…awesum fotoz mom finded…thanx for sharin….R fav iz …EACH !! The little boy walking his cat on a leash, future lion tamer. 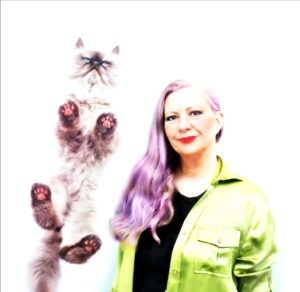 I loved all the pictures, especially the giant cats, those are cool. the photos are super beautiful! and I’m so happy that the kids always loved black cats! I love ALL of these photos, Layla. Especially the ones of the Japanese black cat and its human, and the one of the African American child and his “baby” cat. So sweet. This just shows how popular black cats really are! Great photos! Gorgeous photos of gorgeous gatos negros! Thanks Tamago. 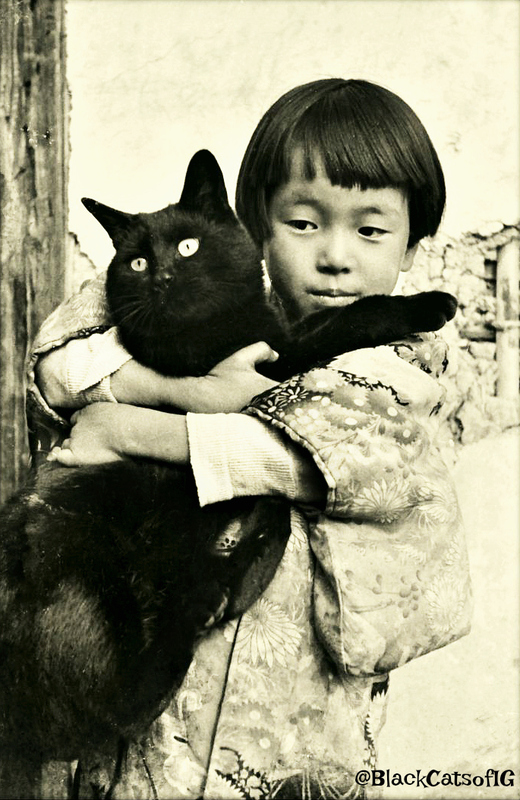 Can you recall seeing vintage photos of children in Japan with cats? Those giant kitties are amazing. Thank you for compiling and sharing these beautiful photos! I really enjoyed this post! 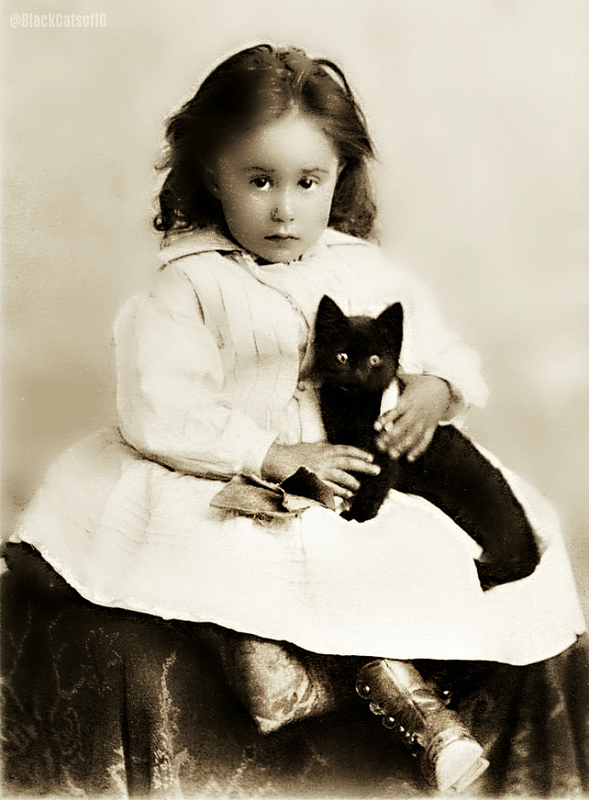 My favorite photo was of the little girl hugging her cat from Japan! Thanks so much! It’s my favorite too but I can’t tell if it’s a boy or a girl. The styles are gender neutral. Wow, gorgeous photos. So telling, the unpoised or even the poised photos. Such emotion is emitted, and brings us back to the world of the photograph.